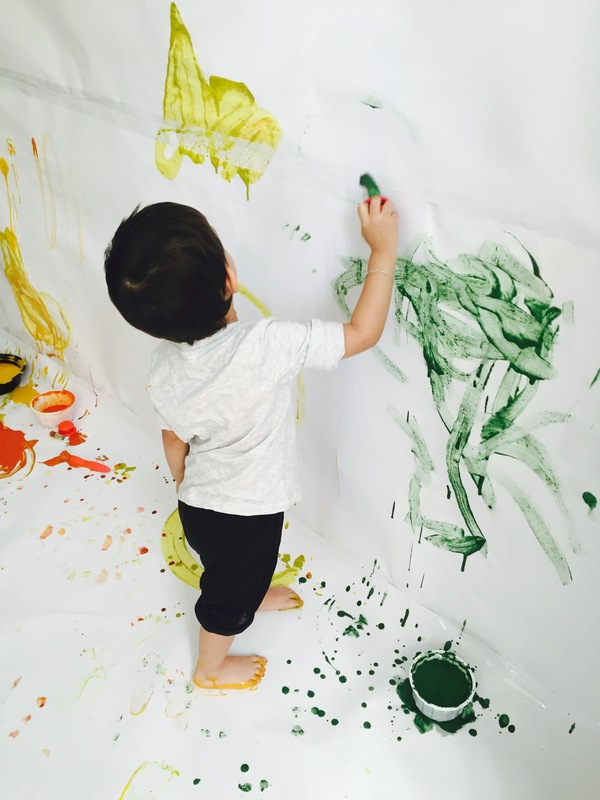 Last Thursday, I was invited to check out the Messy Times class at Soul Art Center, located in The Residences 1, Tower 1, in Downtown Dubai. The class ran from 3:30 pm to 5 pm, and are currently held once every month. 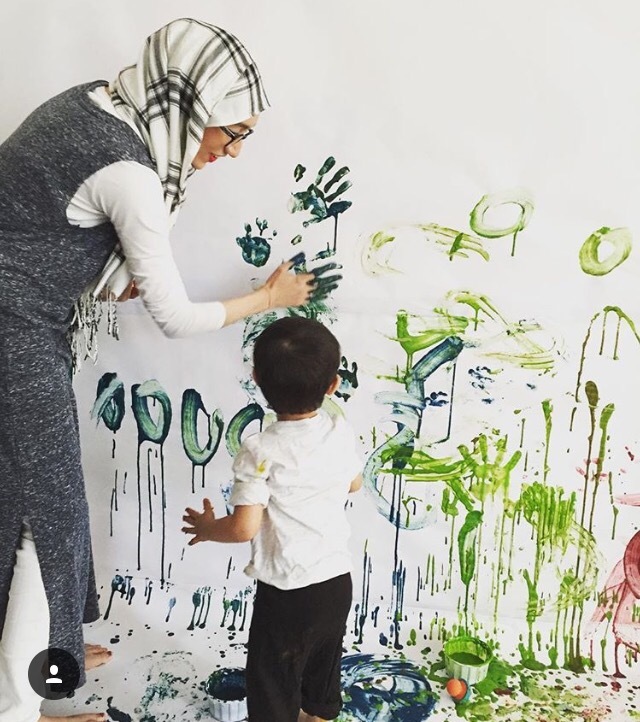 The class is attended by about 20 mums and their tots, and is a class that allows the little ones to let loose, explore and develop their skills using paint and play dough, amongst other things. 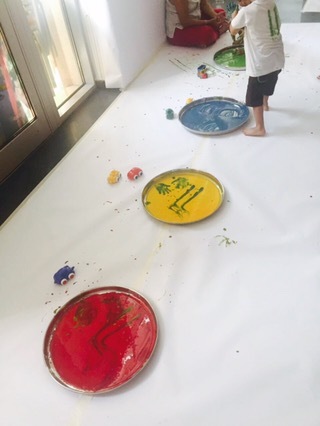 Considering that Baby Z has been really into painting this summer (as you may have guessed from my Snapchat: zenisanj), because indoor entertaining has been a MUST in this Dubai Summer Heat, we were very much excited. Also, of course I have been painting from a very young age and would love for Baby Z to gain similar exposure to as much Art as he possibly can, therefore this was perfectly suited for us both! Spend quality time with your toddler. 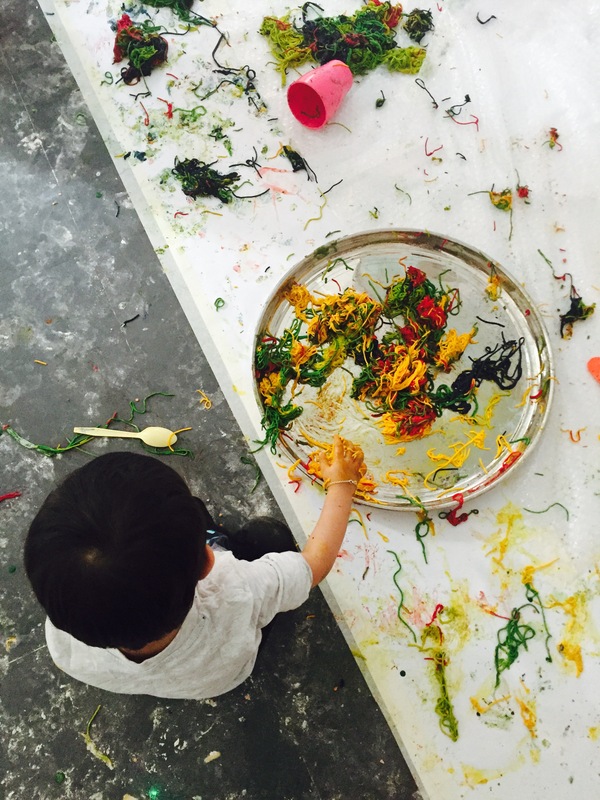 Messy time sessions give young children the freedom to play messily, helping them to develop their imagination and social skills, boosting their confidence and helping them to understand the world around them. 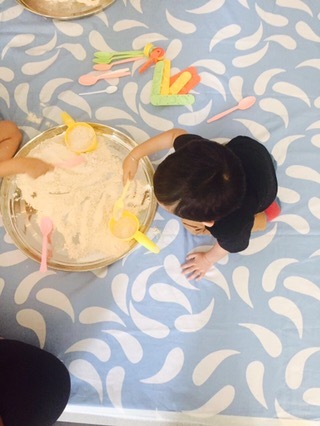 The class is aimed at kids aged between 6 months and 4 years old and before we walked in, the instructor clearly stated that the only rule we have once you enter the room is to have fun, and that is exactly what we did! We entered the large space and there were five different activity stations around the room. 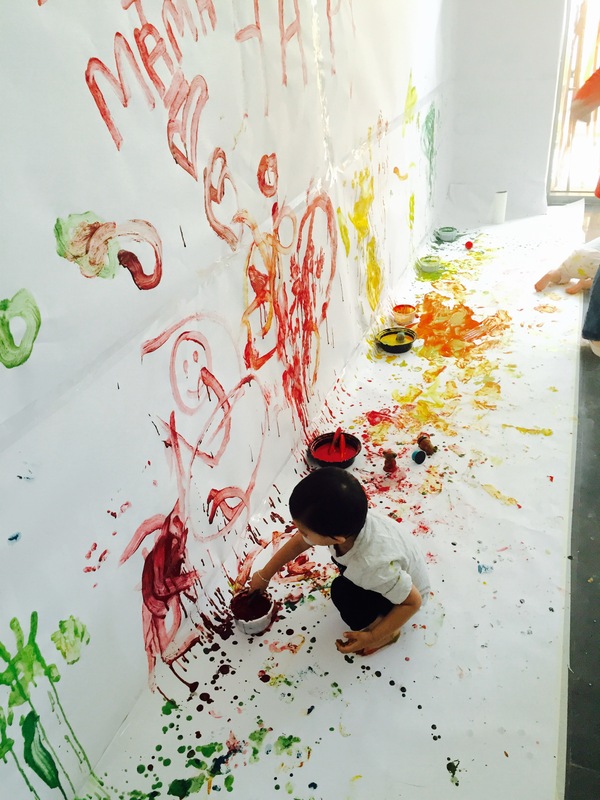 The back of the room was lined with paper and had bowls of colourful paints along with various paint brushes. On the right, was another painting station, but here there were only four trays with paint in them, and the idea was to paint with your hands and feet. The front of the room had a bubble wrap wall along with a tray of coloured spaghetti to squish between your fingers. 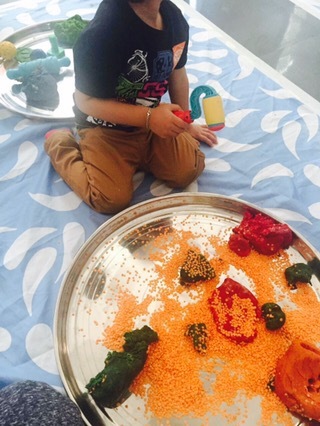 There were two smaller station in the middle of the room, one with two trays full of flour along with cups, spoons and other such materials, whilst the other station consisted of play dough, bright orange pulses and shaping equipment. 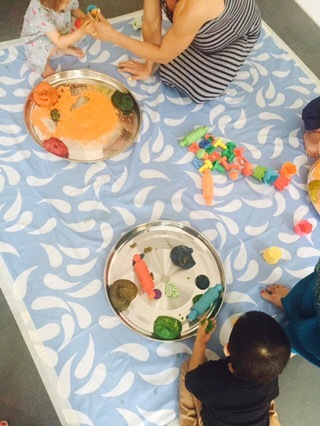 The instructor notified us all that all the play materials inside the trays in the room were edible, including the paint and play dough. 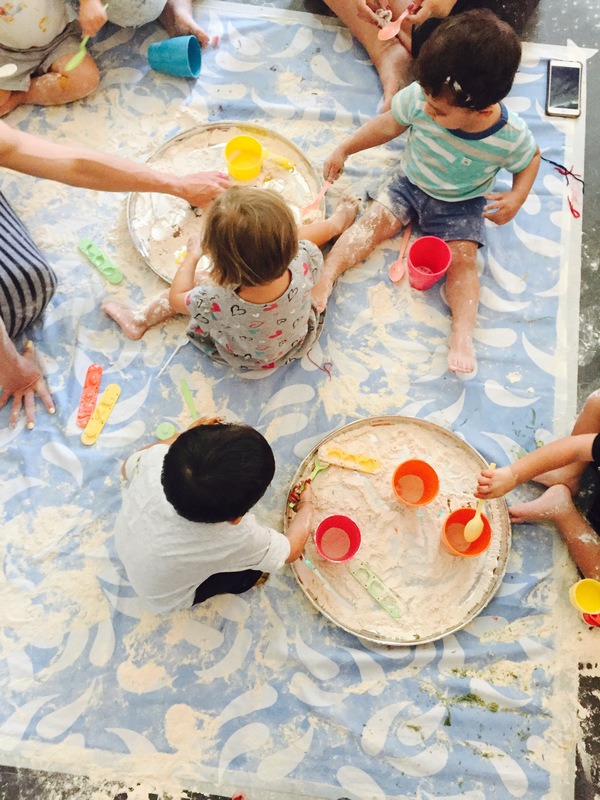 Also, I am sure a play expert would be able to tell you exactly that each activity had a significance and aided to improve a specific development skill, but to your toddler (and myself included) it all looked like great fun and we couldn’t wait to get our hands dirty. There was only one problem of course. I had not come prepared. 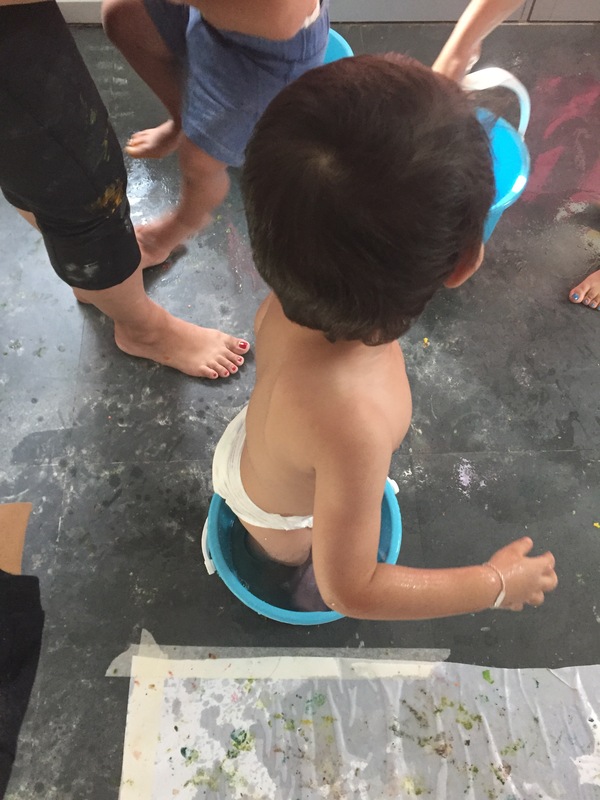 For the first time, I had overlooked researching into what the class was exactly, and presumed the kids would be given aprons or overalls, whilst the parents looked on proudly, well away from the mess. The reality was far from it. This class was all about getting knee deep in paint. Literally. Thankfully, I had a backup change of clothes for Baby Z in his changing bag so swiftly changed him into these and then let him simply go for it. Then arose another problem. He was being a bit of a neat freak. Like me. 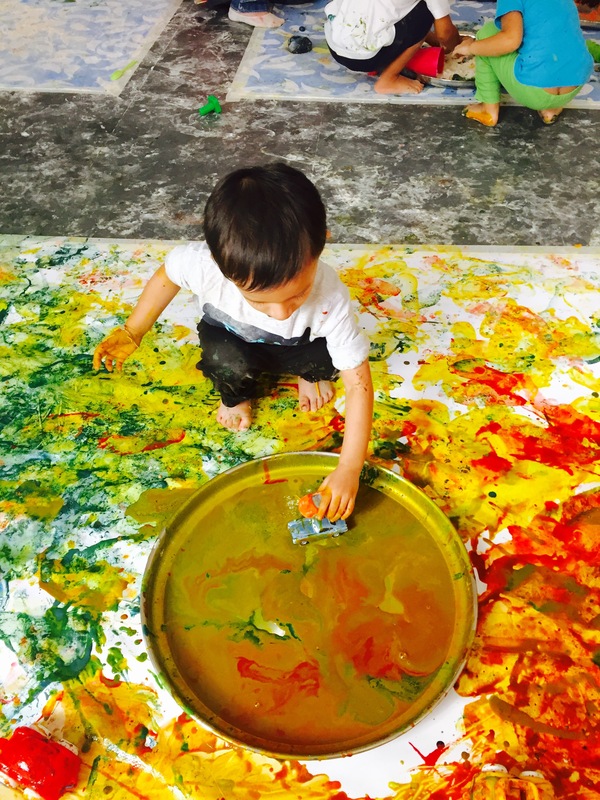 As soon as he touched something, he would ask for me to wash his hands, and after much coaxing he finally began to feel comfortable with being messy. 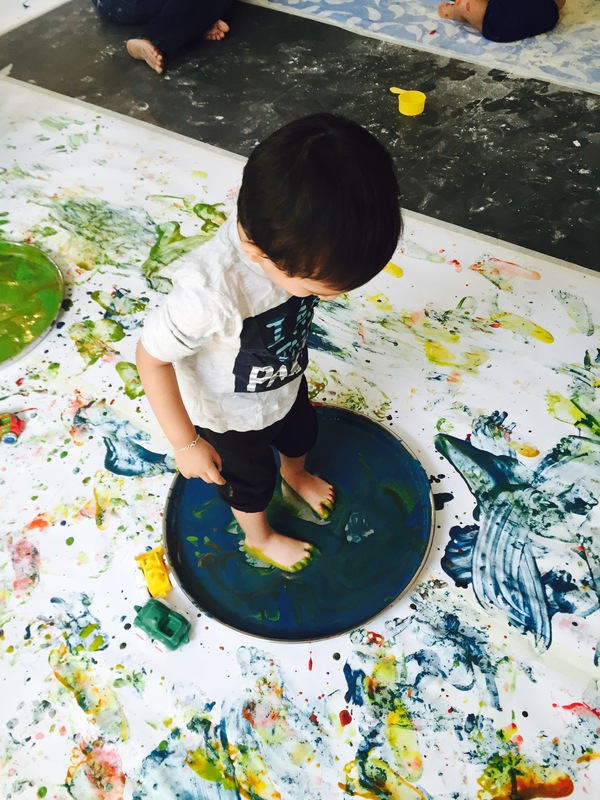 I think what helped most was when I myself got down on my knees and got stuck in to the activities with him as much as I could, especially encouraging him to paint with his hands and feet by doing the same myself. Therefore, fair warning to anyone going to these classes, bring a change of clothes for your little ones as well as yourself! Oh and perhaps leave you intricately detailed wedding ring at home too. Also, avoid wearing white! You will not be leaving with the same colour of fingers and toes that you came in with, for sure. Having said that though, I did get a very long streak of the edible paint on my white jeans, yet they came out of the washer perfectly fine, so do not worry, the paints will not stain and are very easy to wash off. Baby Z had a grand time, after he eventually got over his aversion to being messy, and I must admit, I had just as much fun as him! The instructor too was really helpful and encouraging to all parents and toddlers. Anyway, I will let the rest of the pictures speak for themselves, as they do so very well. Did you note how Baby Z is squatting in all the photos, whereas the other kids have no issues sitting down on their bottoms? Haha! He gets that aversion to mess from me, so I guess I shouldn’t be making fun of him really, but it was so cute to watch! Once the class was complete, and there was not an inch of plump, clean, pink skin left un-painted or un-floured, buckets filled with soapy water were brought out along with towels to wash off the children. This was definitely very helpful as no mother wants to be driving home with a sticky toddler, do we? For the rest of the day, I couldn’t stop hearing Baby Z babbling away about his “pant-ins” (paintings) that he did and he was so proud too. 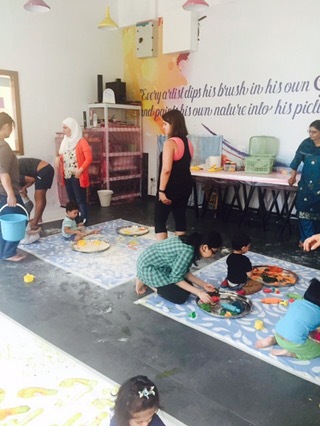 This was a great class, not only for Baby Z and spending quality time with him, whilst letting him be free in a way that perhaps we normally don’t let them be at home, but also to meet other mummies in Dubai and bond over our kids. The price for a parent and child to attend this class is currently AED 130, and another AED 50 for any additional parent or child. You do have to book in advance as there can be a waiting list, and dates do vary every month. I think because all the material is provided and no clean up needs to be done after on your part (just bathing your toddler when you get home), it is quite reasonably priced, especially for the prime location it is in. 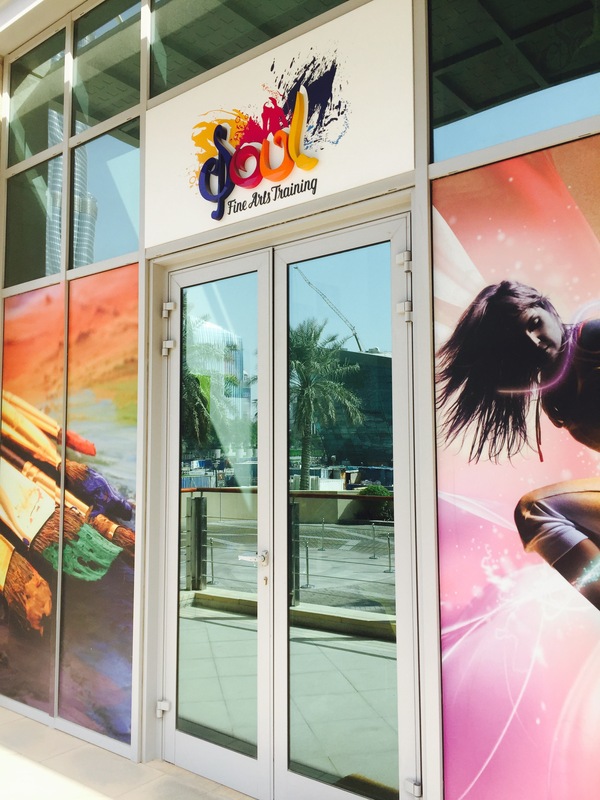 The Soul Art Center also has a wide range of other Art and Dance Programs, designed for all ages and skill sets. It is very easy to find the right one for you or your child. If you would like to find out more or book your next class, head on over to their website www.soulartcenter.com, or follow them on Facebook and Instagram. Note: I was invited by The Soul Art Center to review the Messy Times Class, however all views and opinions are honest and my own. This must be a dream-come-true for the little ones. Cannot help but notice-what a beautiful name? Soul Art Centre. It really was, and yes the centre has some great art and fitness classes for adults too! Do check them out! haha yes, it was insane! There were babies whose faces and mouths especially were covered in paint! Good thing it was edible!! Its nice to see kids really enjoying it. Yes, it was great fun!